Despite record shale production in other parts of the state, oil and natural gas development is relatively new to Ohio’s Ashland county region. And as is the case whenever a “new-to-you” industry enters a community, there can exist a bit of a learning curve in terms of understanding the operational process and potential impacts that industry might have. A recent Ashland Times-Gazette letter authored by Deborah Hughes is a prime example of this. The letter questioned the economic impact that Cabot Oil and Gas – which recently began oil and natural gas exploration in Ashland County – has had in Pennsylvania, where the company is currently the second highest producer of natural gas. FACT: Cabot has never claimed it has paid $9 billion in royalties, but the company – and the natural gas industry as a whole – has invested heavily in the Appalachian Basin. The $9 billion figure referenced in the Ashland Times-Gazette article was misreported and has yet to be corrected to accurately reflect the royalty figures despite requests to do so. In full disclosure: Cabot has actually paid $1 billion in royalties to residents of Susquehanna and Wyoming Counties as of the summer of 2017, a vast majority of which has been distributed in Susquehanna County, where Cabot has developed all but two of its Pa. shale wells. To be clear, a $1 billion infusion is huge for a county with a population of less than 42,000 people. For perspective, Ashland County’s population of roughly 53,000 people isn’t much higher. That chart alone represents more than $6.2 billion in investments, and doesn’t even include things like the yearly “Give a screening, get a screening” program, Junior Achievement educational partnerships, annual toy and food drives, time, equipment and monetary donations to the Susquehanna County Career & Technology Center, increased natural gas local distribution campaigns, and various other grants over the last decade. FACT: Susquehanna County is fully employed and the multiplier effect on job creation from oil and gas is tremendous. For all intents and purposes, because “full employment” is never actually counted at zero percent due to the natural fluctuation of the jobs market, Susquehanna County is fully employed. In fact, a 2017 PricewaterhouseCooper study found that the oil and natural gas industry directly and indirectly employed more than 300,000 people in Pennsylvania in 2015. From local hotels and restaurants to truck drivers and excavation companies, and of course the employees working directly on a well site, the natural gas industry has helped to spur unprecedented employment and business growth in the Appalachian Basin. 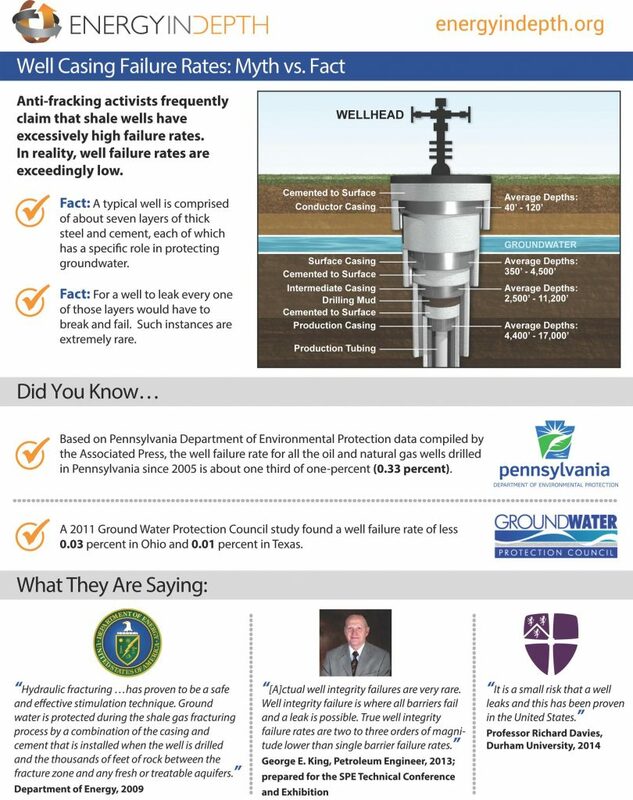 FACT: A decade of study and experience has shown fracking is not a major threat to groundwater. Despite nearly a decade of safeguarding the environment during its operations, Cabot has one blight on its record that activists are insistent on continually discussing. This singularly available example actually shows just how successful the company has been in safely developing natural gas in Pennsylvania. And claims of water contamination in Dimock, Pa. are a lot more detailed and complicated than Hughes’ oversimplified assertion. It was not “overwhelming evidence” that led to Cabot being held responsible for claims of methane migration for several households within a nine-square mile area in Dimock known as the Dimock Box. The company fell under Pennsylvania’s “presumption of liability” law, meaning that a company is held accountable for any contamination within a certain distance from a well regardless of whether it had anything to do with it. In the absence of baseline water testing that went above and beyond the Pa. Department of Environmental Protection’s (DEP) required circumference from the well in 2009, Cabot had no solid evidence under the law to prove it did not cause methane to migrate under the law. Cabot entered a “Consent Agreement” with these households that halted drilling and completions in the Dimock Box, required the company to supply water for a period of time, pay for treatment and regularly test the water quality for those households. It also led to some monetary settlements and cases of litigation – the most recent of which was sent for retrial in March 2017. The U.S. Environmental Protection Agency (EPA), DEP and Cabot’s water testing all showed that levels of methane were reduced with and without treatment in these households. In fact, the EPA’s 2012 testing concluded that water quality did not pose a threat to human health and no further action was warranted by the agency. Equally important to understand is that a myriad of water studies, historical accounts and expert testimonies have concluded the county has a long history of naturally occurring methane in its water supplies. A 2018 Yale University study found water quality in Susquehanna County has not been impaired by natural gas drilling, and a 2018 Penn State University study of Bradford County, Pa. found water quality has actually improved since shale development began in the region. Additionally, the Susquehanna River Basin Commission’s (SRBC) continuous monitoring of the basin – of which Susquehanna and Bradford counties are located – has found “no discernable impacts” to water quality or quantity in the region from oil and gas activities year after year. Unlike the contradictory data cited by Hughes – data that comes from two organizations with clear agendas to shut down the Appalachian Basin’s oil and gas industry: Earthworks and Public Herald – the Yale, Penn State and SRBC findings are based on actual water sampling and monitoring near shale activity. Further, a situation like this is even less likely to occur in Ohio because the state has far stricter water well regulations than neighboring Pennsylvania. A recent University of Cincinnati water quality study, which found no increases in methane concentration in water wells in five of the most heavily developed shale counties in Ohio, further demonstrates this fact. FACT: Well casing failures are exceedingly rare. The oil and natural gas industry – including Cabot Oil & Gas – has a decade-long history of safely developing these important resources in the Appalachian Basin. And while oil and natural gas exploration is new to Ashland County, the development of these resources has been game-changing for Ohio’s shale counties and neighboring Pennsylvania and West Virginia. If all goes well with Cabot’s exploration wells, Ashland might experience similar opportunities.